I love this cute stamp set from Unity Stamp Company! It’s called Life is Sweeter with Treats and you can find it here. I stamped the frozen treats stamp with Memento Tuxedo Black ink on white card stock and colored it with Copic markers. Then I added just a little clear glitter glue to each popsicle. I punched out the image with a circle punch and layered it to a scalloped circle punched (or this die set is great!) from orange card stock. I stamped the sentiment with orange ink on white card stock and trimmed it close. 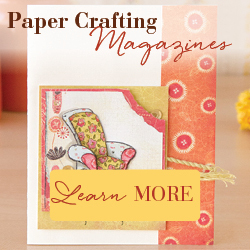 To assemble the card, attach a piece of orange card stock to a white card. Layer a slightly smaller piece of green polka dot paper over the orange card stock. Attach the punched border piece to the card. Attach the stamped sentiment, tucking it slightly under the orange card stock. Attach the stamped frozen treats to the card with foam tape. To finish the card, add 3 tiny gems next to the sentiment. Such a cute card for a Summer birthday, a thank you, or just thinking of you!